There’s a dear man in my congregation who has spent his life creating things. An architect and builder by trade, his artistic talents seem to know no bounds. Jim can take a hunk of wood and make it into a barrel, a sleigh, a processional cross, pectoral cross, a ladder, or any other thing he feels compelled to create. Each piece he makes is a reflection of his God-given talent and personality. Paul wrote words of encouragement to the church in Ephesus in the face of their newly discovered walk with Christ: “For we are (God’s) workmanship, created in Christ Jesus for good works, which God prepared beforehand, that we should walk in them” (Eph 2:10). 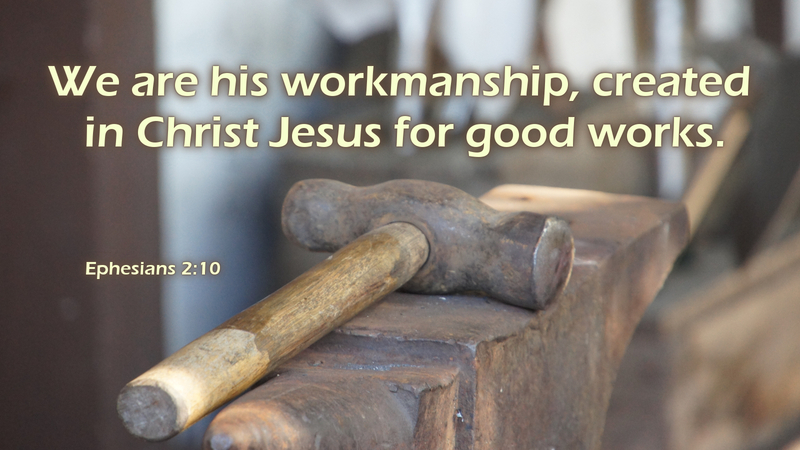 We are God’s workmanship—creatively fashioned, uniquely crafted, lovingly molded. We bear the mark of his creativity and personality. When others look at us, if they see anything that is good, holy, or beautiful, it is Christ that they see. Further, we were fashioned by our Lord for the sake of his kingdom work—not so that good works will save us (we know that isn’t true), but for the sake of those who do not yet know that they are God’s workmanship as well. Prayer: Holy God, who created us in your own image, help us to bear your love to the world so that all might come to know Jesus Christ as Lord and Savior. Amen. Today’s devotion was written by the Rev. Dr. Amy C. Little, Pastor of Trinity Lutheran Church, Monroeville, OH, and Submissions Editor for Sola Publishing.